How Did People Vote and Who Did They Vote for? You know who won the 2012 presidential election. What you may not know is which candidate did best among the different ways that people vote. A few states report their election results by how people voted: mail ballots, in-person early voting, Election Day voters, people who cast a provisional ballot, and even overseas voters. Often, this reporting is possible because these states report their results in separate precincts for each type of voting. There is no consistency among states as to how they report these election results; no state breaks down their results into all the voting method categories. These statistics are reported in the Table: Obama Vote Share by Voting Method. The numbers can be a little confusing at first because of the varied way in which states report their statistics. So, let's start with describing the different voting methods. Election Day Voters are persons who cast a vote at a polling location on Election Day. Early Voters: Mail and In-Person are votes cast prior to Election Day -- either by mail or in-person -- where a state does not further distinguish between these two voting methods. To give further perspective, the number of all early votes cast as a percentage of all votes is provided. States are also identified if in-person early voting is permitted and if voters must provide a valid excuse to vote a mail ballot. Early Voters: In-Person are votes cast prior to Election Day in-person, where a state also reports election results for early voters who cast mail votes. Most states permit in-person early voting at special polling locations, but some do not. Early Voters: Mail are votes cast prior to Election Day by mail, either where this is the only method of early voting permitted or where a state also reports election results for early voters who cast in-person votes. In most states where mail balloting is the only early voting option, voters must also provide a state-approved valid excuse, such as being absent from their residence or otherwise unable to travel to the polls -- except for the all-mail ballot states such as Oregon and Washington. Provisional Ballots are votes that are usually cast when there is a problem with a person's voter registration or another issue at the polls. A few states also use them for other purposes, such as Florida and Ohio which use provisional ballots to process address changes on Election Day. Overseas and Military Voters are also known by the acronym UOCAVA voters for the federal Uniformed and Overseas Civilian Absentee Voting Act -- that is, overseas civilian and domestic and overseas military voters. Two states report separate election results for UOCAVA voters -- Hawaii and Maine. These statistics reveal that that Barack Obama's support varied across voting methods. While the directions of support are not consistent across states, patterns emerge that inform why we see battles over policies such as voter identification and early voting. A major legal battle in the 2012 election was the Obama campaign's attempts to overturn Republican state government laws in Florida and Ohio enacted since 2010 aimed at reducing the number of days in-person early voting is allowed. Under the radar -- perhaps because it happened in non-battleground states -- Republican-controlled local electoral boards in states like Indiana voted not to allow in-person early voting at satellite voting locations, even although it was offered in 2008. Why? In the eight states where election results are reported for in-person early voters Obama fared better than Election Day voters by an average of 5.1 percentage points. New Mexico is the only state where this is not true. Furthermore, in the three states where all early votes are combined into one category, Obama fared better among early voters than Election Day voters by an average of 8.7 percentage points. Arizona is the only state where Obama fared worse. The Census Bureau will report later in 2013 results from a large-scale survey that may illuminate why Arizona and New Mexico are exceptions, but only by a little, with Obama doing better among Election Day voters by 0.5 and 1.0 percentage points, respectively. 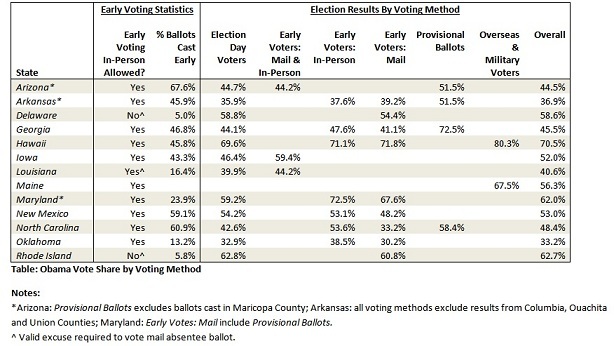 These statistics also confirm the pre-election surveys that showed Obama winning the early vote, since where in-person early voting and mail voting are both allowed, voters tend to favor voting in-person over mail balloting by large numbers. The largest percentages of early voting shown in the table above are in states that allow in-person early voting. Another action by Republican state governments is also stripped to its partisan ramifications when election results for mail ballots are compared to other voting methods. Republicans have enacted photo identification requirements for in-person voters -- either on Election Day or early -- but have exempted persons who vote by mail from these requirements. In the nine states that report election results for mail early voters separately from other voting methods, Obama fared worse than Election Day voters by an average of 1.5 percentage points. Obama fared better among these voters only in Arkansas, Hawaii, and Maryland by 3.3, 2.2 and 8.4 percentage points, respectively. Maryland's pattern is perhaps explained in that the state combines mail ballots and provisional ballots into one category; and we will see that Obama did exceptionally well among provisional voters. Iowa's experience with early voting merits special attention. Obama won the state's early voters by 13 percentage points. Although the state does not distinguish between in-person and mail votes, many if not the majority of these votes were likely cast by mail, not in-person. Consider that the state reported 689,661 votes cast early as of November 6 (election officials continued to accept ballots postmarked on November 5 and received by November 13). By the first day of the in-person early voting period on September 27, 203,081 persons had already requested a mail ballot. Iowa's Democratic Party has a tradition of mobilizing Democrats to vote early. Even in 2004, John Kerry won the Iowa's early and special ballots precincts with 58.5 percent of the vote, while losing the state by a little under ten thousand votes. In the aftermath, the Kerry campaign accused Iowa Democrats of spending too much effort on early voting mobilization and too little on Election Day. Photo identification laws, by exempting mail voters, tend to relieve Republican voters of the identification burden. The irony is that mail balloting is the voting method known to have the highest incidence of vote fraud, which is often given as the reason for identification laws (keep in mind, even here it is extremely rare). Completely tongue-in-cheek, one may wonder why Republicans are encouraging more vote fraud by adopting photo identification laws that exempt mail voters, and thus encouraging more people to vote-by-mail. But to take the tongue out slightly, with Democratic campaign tactics changing to embrace mail balloting, conservative pundits like John Fund have begun questioning vote-by-mail, noting in his book Stealing Elections, that "Absentee voting used to be available only to those legitimately out of town or physically unable to vote in person...as the arguments against promiscuous absentee or early voting mount, it is time to rethink this trend." Expect more of this rhetoric aimed at mail balloting in the years to come. Provisional ballots were mandated for federal elections by the 2002 Help America Vote Act. They are often used when people have a problem at the polling place that prevents them from voting, such as a voter registration problem. One of the ways that this can happen is when a voter tries to vote in the wrong precinct. In some places -- predominantly urban locales -- voting for multiple precincts may be held in the same polling location, such as a school gym. This can lead to a problem known as "right church, wrong pew" where a voter is directed by an election worker in these super-polling locations to the wrong precinct. The voter does not appear on the voting list and is handed a provisional ballot, which does not count in some states when a person votes in the wrong precinct. Not surprisingly, this was litigated in Ohio, with a federal court ruling that voters should not be disenfranchised for being directed by an election worker to the wrong precinct. Why might policies be enacted to make provisional ballots less likely to be counted? In the four states that report election results separately for provisional ballots, Obama won 17.2 percentage points more vote share compared to the overall election results. UOCAVA refers to the Uniformed and Overseas Civilian Absentee Voting Act, and is a general shorthand for overseas civilians or overseas and domestic military personnel who vote an absentee ballot. Federal laws like UOCAVA and the MOVE (Military and Overseas Voter Empowerment) Act require election officials to treat these voters differently than domestic civilian voters, for example, by sending ballots earlier with an option for the voter to receive their ballots electronically. Some states even allow UOCAVA voters to return ballots electronically! Most states add UOCAVA voters with their other mail ballots. In the two states that report separate election results for UOCAVA voters -- Hawaii and Maine -- Obama performed an average of 10.5 percentage points better than the overall electorate. This may come as a surprise since "UOCAVA" is usually considered a synonym for military voters, which are generally considered to favor Republicans. However, these statistics make sense if there are a greater number of overseas civilians than military personnel in these states. North Carolina provides evidence in support. Although the state does not report election results for UOCAVA voters, the party registration of military and overseas civilian voters is tracked. For military voters, 40.9 percent register as Republicans and 30.9 percent register as Democrats. Conversely, only 22.7 percent of overseas civilians register as Republicans and 43.3 percent register as Democrats. It may thus be that UOCAVA voters in Hawaii and Maine are more often overseas civilians than military personnel. In the 2012 general election, Democrats tend to vote early in-person and by provisional ballots, while Republicans tend to favor mail balloting, with Election Day voters usually falling in-between. Policymakers who wish to expand or curtail a method of voting assume that campaigns and voters will passively react to a new law -- say to reduce in-person early voting hours -- by not voting. Some of the states that buck these trends suggest otherwise. Voting behavior and campaign tactics can change to meet new election circumstances. Democratic campaign tactics in Florida and Iowa demonstrate that Democratic voters will vote by mail when encouraged to do so. Indeed, although not analyzed, Oregon and Washington hold their elections entirely by mail, and Obama won both states. Working with election administrators, I know that rural election officials are the most stressed: usually a part-time county clerk runs elections on a shoestring budget. Instead of trying to play games with election laws by making it more difficult to vote -- spending literally tens of millions of dollars we don't have to implement photo identification laws and to defend restrictive voting laws in court -- Republicans would be better served by making rural voters' election experiences better, thereby increasing the turnout of their base, rather than giving a rallying cry to their opponents by trying to reduce Democratic turnout.